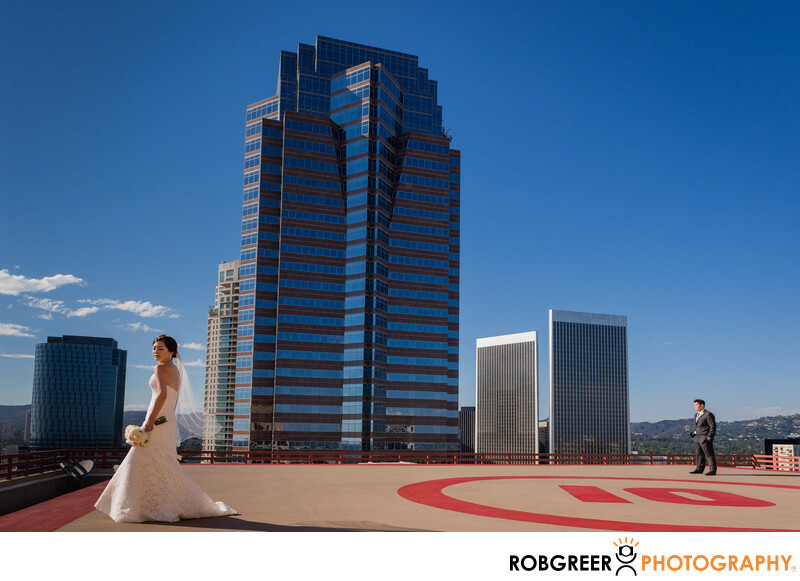 For this hotel wedding in Los Angeles at the Century City InterContinental near Fox Studios we were fortunate enough to be given rooftop access. To increase the drama of this photograph, I place the bride in the near foreground to the left of the frame and the groom in the far background to the right of the frame. Since this was in direct sunlight in the middle of the day, I used several technical posing methods to ensure that I had a good image. First of all, I posed the bride in such a way so that the highlight from the sun was only a sliver across her body, while I had the groom face straight on into the light, but shift his feet apart slightly to give proper perspective I then made sure that both subjects were above the horizon line, although I would've preferred to get the groom a little bit higher in the frame so that the horizon line wasn't so close to his shoulders. Unfortunately, given the room that I had available to work on this rooftop that was impossible if I wanted to keep him outside of the circle that indicates the he the pad area. You'll note that he is standing outside of the circle and that you can read the number 10 plainly in the photograph. As an interesting note, the largest building in the background is quite famous in terms of film history. It was the building called Nakatomi Plaza in the film Die Hard. In real life, it's actually Fox Plaza, a 35-story skyscraper in Century City. It was built in 1987. Interestingly, the lobby is seen during the opening scene of Speed and the building is also destroyed at the end of the film Fight Club. Century City InterContinental is located in Los Angeles, California. Phone: (310) 284-6500. Website: http://www.intercontinentallosangeles.com. Contact Person: Michelle Sussman, michelle.sussman@ihg.com. Location: 151 Avenue of Stars, Los Angeles, CA 90067. 1/1000; f/9.0; ISO 800; 24.0 mm.